Mike Holt and Carl Smit put the hammer down on day one of the SAP 505 World Championship to nail the first two races in sunny Port Elizabeth, South Africa. The first race, held in steady, 15 knot easterly winds on a lumpy Algoa Bay, saw a four way battle develop between some of the hot favourites. Australians Sandy Higgins/Paul Marsh and Michael Quirk/ Luke Payne were up at the front from early on, with double 505 World Champion from Denmark, Jan Saugmann/ Jakob Karbo and Holt/Smit not far back. Holt and Smit seemed to be able to sail slightly higher upwind, but their real advantage was on the downwind legs when they could take chunks out of the opposition as they steered through the big waves with more power than their rivals. 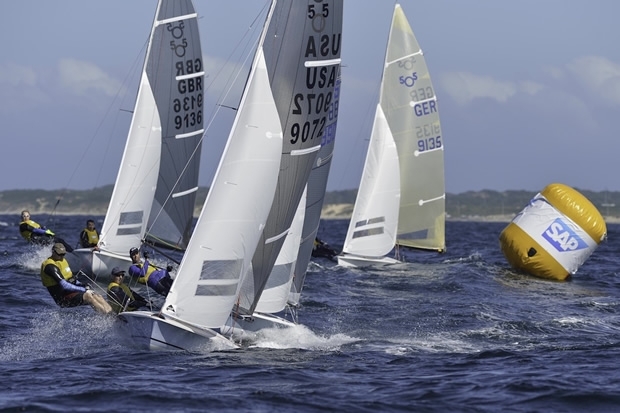 Higgins and Marsh still held a 70-metre lead going around the final windward mark, but the chasing Americans were too fast, out-gybing the Aussies and surging into the lead to win the first race just a few hundred metres before the finish. Race 2, and with a slight increase in breeze, Holt and Smit were even more dominant as they took an early lead by the first turning mark. The Californians then extended their advantage as a close tussle developed between the chasing pack. This time it was the German crew of Stefan Boehm and Gerard Roos who took second place after emerging on top of a duel with 2008 World Champion, Great Britain’s Ian Pinnell sailing with Germany’s Johannes Tellen. Former World Champions Howie Hamlin and Jeff Nelson managed to get on to the water in time for today’s racing after five hectic days getting their brand new boat ready for action. However, Hamlin and Nelson will be disappointed to be lying in 10th place after day one. Top of the South Africans are 8th placed brothers, Peter and Thomas Funke, who came 5th in race one and will be looking to secure a place in the top 10 by the end of the regatta next Friday. The brothers have been part of a massive local effort by the members of Algoa Bay Yacht Club and of Port Elizabeth residents generally to make this a World Championship to remember. “P.E. is the watersports capital of South Africa, and the sailing conditions are fantastic,” said Thomas, who is pleased to have the relatively simple task of going racing after three years of preparation and long days making sure that the regatta would run smoothly. A late charge into 4th place just before the finish line of race 2 sees Michael Quirk and Luke Payne of Australia sitting in 2nd overall on 7 points, just one point ahead of fellow Aussies Higgins and Marsh. Higgins was disappointed to have been outmanoeuvred by Holt for victory in race one, but believes he can still beat the American this week.